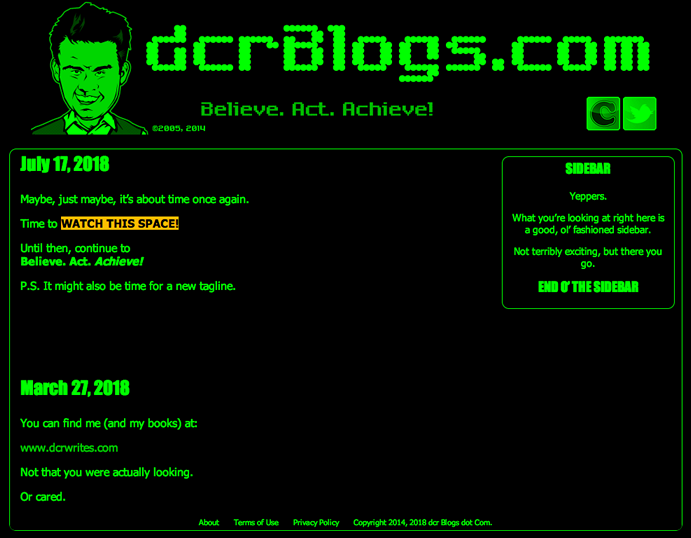 Dan's Lame Blog – dcr Blogs dot Com | And We’re Back . . . This blog is kind of like a zombie . . . always coming back from the dead. For the record, this updated blog is that time. Again. Back from the dead. Again. The old tagline originated in this old “Not So Secret” post way back in August of 2007. You can read more of the story in this old “What You Think This Blog is All About” post from January of 2008. It was previously Dan’s Lame Blog back in 2012 for a while a few months after I started Dan’s Lame List (and before I released Dan’s Lame Novel). Switched back in July of 2012 to using “Believe. Act. Achieve!” again. But, anyway, it’s time for a change. Not that I’m discouraging anyone from believing, acting and achieving. It’s just time for the blog’s second (or third or fourth or whatever) life. You should continue to Believe. Act. Achieve! It’s simply time for a change. Time to make blogging fun again. So, stay tuned to Dan’s Lame Blog and, hopefully, you will discover that it’s actually some kind of awesome.